The Geovision Surveillance DVR's are capable of exporting recorded video to a USB flash drive, USB external hard drive or to a CD / DVD. Users can then playback the exported video on any PC. 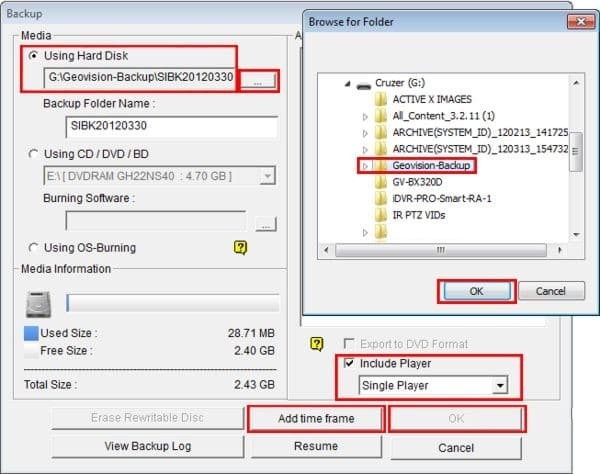 The instructions below explain how to export and playback recorded video on a Geovision Surveillance DVR using a USB thumb drive. 1. Insert a USB thumb drive into the USB drive of the Geovision Surveillance DVR. 2. Then on the main screen of the GV-System, click the button. Then select Video / Audio Log. 3. Now click the button on the functional panel. 4. Select Using Hard Disk to export the files to the USB device. Then select the folder you wish to save it to. 5. Now click Add Time Frame. 7. Select the camera(s) you wish to backup. 8. Use the drop-down list to select the type of events you would like to backup. Example: Video, Audio or both together. 9. Click OK to add the time frame. You can repeat for up to ten-time frames. 10. Then click Include Player to load the media player used for playback onto the disc. In the drop-down box below Include Player, select either Viewlog or Single Player. I will be using Single Player in this example because of its ease of use. 11. Now click OK on the Backup menu to initiate the export. Once completed, remove the USB thumb drive. Include daylight saving rollback events: Click to back up events recorded during Daylight Saving Time. Bookmarked Files: Click to back up the bookmarked frames in JPEG format. 1. Insert the USB thumb drive that you exported the video to into your PC's USB port. 4. Now go to File, then click Open Folder. Then select the camera you would like to view and click OK.
5. Your video will now begin to play. (Shown Below) You can click File again to select a different camera.